This coming Saturday’s Floyd Mayweather-Conor McGregor fight is a throwback to the manufactured spectacles of the 1970’s, a time when mass audiences were treated to events like the “Battle Of The Sexes” tennis exhibition between Billie Jean King and Bobby Riggs or Evel Knieval attempting to jump Snake River Canyon, or George Foreman beating five men in one night. Back in the days before eight-figure network deals and astronomical appearance fees, professional athletes of even the highest order tended to need a little income on the side. This was the context in which the legendary reigning heavyweight champion Muhammad Ali agreed to engage in a multi-discipline boxing/martial arts exhibition with the celebrated Japanese pro wrestler and combat athlete Antonio Inoki. The story, to the extent that it makes any sense, is that Ali was introduced to a prominent figure in Japan’s wrestling community at a banquet, when he blurted out, “Isn’t there any Oriental fighter who will challenge me? I’ll give him one million dollars if he wins.” Who knows if this is true? It sounds like the sort of thing that Ali might have said, but then absolutely everything sounds like something Ali might have said. What we do know is that Ali in the 70’s had taken to traveling the world in search of the highest possible purses a man of his global stature could demand. This is how he ended up triumphing over George Foreman in Kinshasa, Zaire, in 1974 and barely surviving (but winning) the “Thrilla In Manila” in the Philippines against Joe Frazier in 1975. It is reasonable to surmise that Ali went looking for challenges in Asia knowing that big box office was a distinct possibility. As it turns out, he was correct, though probably not in the way he imagined. After his remarks made news in Japan, Tokyo-based promoters offered Ali 6 million dollars to match skills with Inoki, a revered figure in his home country. It was an ungodly sum for the time and an irresistible payday for Ali, but from the beginning something was not quite right. First off the rules were strange, to put it mildly. No doubt imagining the garish and demonstrably pre-meditated carnival of the American professional wrestling he loved, Ali assumed he was walking into a staged exhibition against a glorified actor. The culture around professional wrestling in Japan has always been far more sober and respectful, with its grand champions held alongside the best-loved and respected athletes in the country. Inoki, a legitimate martial arts-trained badass by any standards, assumed the fight was legit. Eventually the contest was set for June 26th, 1976, at Budokan Stadium in Tokyo. Driven by a “What the hell is this going to be?” intrigue, the worldwide audience television audience eventually reached over a billion people — roughly three times the current population of the United States. A live broadcast brought over 30,000 to Shea Stadium, where the pre-fight live event featured Andre The Giant defeating former Ali foe Chuck Wepner by disqualification after tossing him over the top rope. Theories abound about what actually happened when Ali and Ionki finally met in the ring. As much as Ali is the greatest heavyweight who ever lived, he was no match for a master mixed-martial artist with wrestling skills. One account has it that after Ali’s camp realized Inoki intended a legit or “shoot” fight, they rapidly renegotiated the terms, agreeing to appear only if Inoki refrained from using any of his vaunted grappling skills. Others advance the notion that Inoki was allowed by rule to crush the Greatest at his whim, but neglected to do so out of deference. What did transpire was at once bizarre and, over the course of the bout’s interminable fifteen rounds, both consequential and tedious. Ali wore regulation boxing gloves and Inoki did not. They circled one another warily, with the always-antic Ali shouting insults. 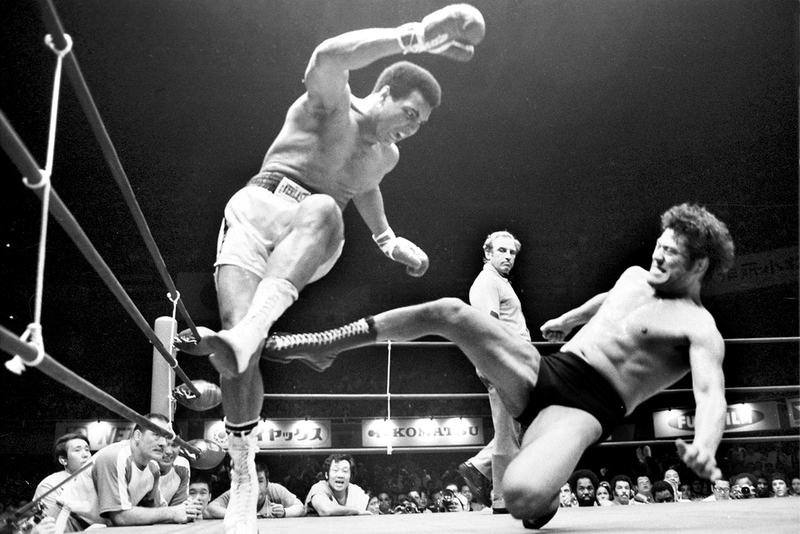 Inoki would dive at Ali and kick him in the legs, while Ali flailed away, attempting to strike an opponent who was frequently seated in the ring. The typically reserved Japanese crowd became restless and a steady stream of boos commenced as it became clear that this awkward dance had no rhyme or reason. That doesn’t mean that there was not the potential for real harm to come to both men, especially Ali. From the first round, Inoki landed hard leg strikes — the sort that raised welts. In the 4th round a series of kicks drove Ali to the ropes, where he mugged and played it off. It still looked awfully painful. In the 5th Inoki scored a nasty looking takedown and followed with additional leg strikes. Ali was already very much on the downside of his career. He was 34 at the time, with his skills in rapid decline. That he would go on to successfully defend his title against stone cold assassins like Ken Norton and Earnie Shavers in the ensuing two years is a testimony to his heart and masochism, both of which have never been in doubt or surpassed. But as soon as his ill-judged 1980 comeback challenge of Heavyweight champion Larry Holmes, he was demonstrating symptoms of the degenerative neural condition that would color his later years with sadness. The brush with Inoki left him with blood clots in his legs. His longtime corner-man Ferdie Pacheco claimed Ali never recovered from the beating, and that he certainly he never moved the same way in the ring again. You can almost hear Marge Gunderson’s scolding voice: “All for a little bit of money.” But it wasn’t just a little, and neither will it be when Mayweather and McGregor meet this coming weekend, in what is a kind of spiritual sequel to that long ago fiasco in Japan. In prizefighting cash is king, and just about any match can be arranged if the public seems intent enough on paying to see it. Who knows what will take place on Saturday when a boxer once again challenges a martial artist with a makeshift set of rules. But the lessons of history —of Ali-Inoki — seem to suggest everything awful and nothing thrilling: pain and disappointment in equal measure. All for a lot of money.